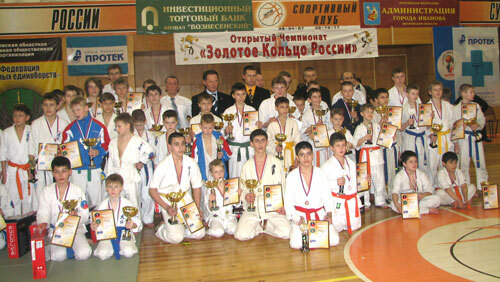 Open All-Russia Knockdown Karate Tournament " The Gold Ring Russia " took place in Ivanovo, Russia. It was organized by Oyama IKF. 203 sportsmen, aged 6- 15 years old, participated in the tournament. They represented 21 cities of Russia, Ukraine, Belarus and Estonia. The first place team was the Saint Petersburg OYAMA Karate Federation. Sensei Igor Gubaydulin, country representative of Oyama IKF in Russia, handed a special prize " The Best Fighter ". 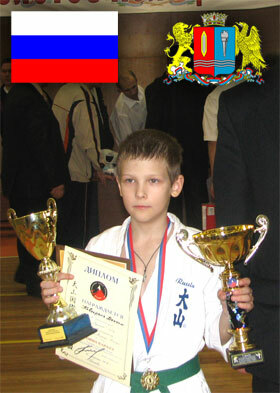 The special title was won by Maxim Kovgoreny - the sportsman representing the Saint Petersburg OYAMA Karate Federation. He received a special cup, the diploma and a monetary prize. All champions received all DVD-players from the sponsor.